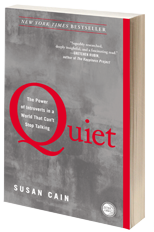 I am reading a wonderful book titled, “Quiet: The Power of Introverts in a World That Can’t Stop Talking“. Author Susan Cain has written the book I have wanted to read for years. I will share more from this book and its careful research in future posts. I thought I knew much on human interactions and how best to organize the workplace. This book changes so much of that thinking. Once again, more to follow and do check out the book for yourself. As to being so sure on what we think we know, the author shares a great quote from Robert Rubin, the U.S. Secretary of the Treasury under President Clinton. than I am of anything. There is power in being thoughtful, expressing doubt, and exploring new solutions. It is the powerful leader that holds these traits. Think about it. We will talk more. As a true introvert, I found this to be one of the most powerful and significant books I’ve read in years. I want everyone (especially extroverts) to read it, too! Thanks for the visit. I need to finish the book. I keep stopping and thinking and rereading sections. Count me as an introvert too! I’ve watched Cain on TED and she was great. Looking forward to reading your review Michael. I will write more about it. All the best.